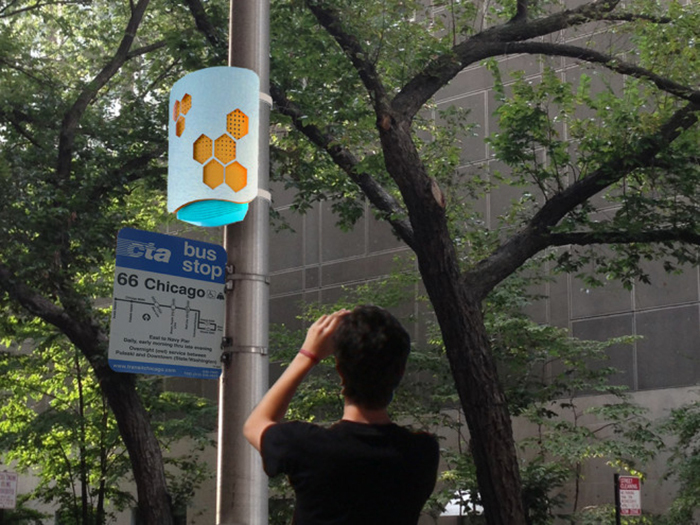 After a year of delays, the Array of Things urban data sensor project is back on track and prepping to collect all sorts of information on Chicago's streets by early next year. Some of that data includes where people are and how they're moving around the city. The Array of Things project is a working collaboration between the Computation Institute, the University of Chicago, Argonne National Laboratory and the School of the Art Institute Chicago. A pilot program was launched in 2014 and 50 modular sensor boxes, referred to as “nodes,” will be installed by the end of the first quarter of 2016, with the number expected to grow to 200 by the end of next year, and 500 by the end of 2017. The location of the nodes will be discussed and determined by the city of Chicago, researchers and community members. One of 11 nodes currently undergoing testing on the University of Chicago campus. The nodes will provide real-time, location-based data about Chicago’s environment, infrastructure and activity to researchers, who will then investigate solutions to a range of urban challenges, including air quality and flooding. Due to the city’s open data policy, the data will also be available to the public, free of charge, through the city of Chicago’s open data network and Plenario, a web-based data portal. Lori Andrews told “Chicago Tonight” during a phone call Tuesday afternoon that she is not convinced the nodes are incapable of collecting data on individual identities and she stressed her concerns about data entering into the wrong hands. In July 2014, "Chicago Tonight" addressed the Array of Things project and the privacy concerns associated with collecting public data. Revisit our story.